The town of Shabla has a population of around 4000. 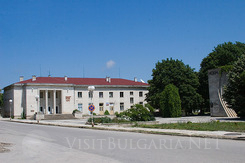 It is situated 24 km South of the border with Romania, 66 km north of Varna, and 536 km north-west of Sofia. The town itself is situated some kilometers from the beach, but there is a camping area called 'camping Dobruja' where some sleeping facilities are available. Camping Dobruja was visited in the past by many toursits, especially from Czech Rep., Poland, Hungary, East Germany. Most of the tourist facilties were built 20 years ago. There were a restaurant, a cinema, night bars, shops, etc. Unfortunately last years Dobruja camping has very little visitors, mainly Bulgarians. The resort infrastructure is not in a good condition, although there are still some shops and places to eat. As for the town of Shabla itself, three kilometres away from the town is located the Shabla lake where various species of wild geese nest; at the same time it is a wonderful place for fishing and recreation. The lake near the beach has curative mud, which some poeple use. In the town of Shabla there are an old communal cultural centre, a museum collection and a small art gallery in the town. On 24th May each year a grand fest of folklore is held with songs, dances and crafts exhibitions. There is a small hotel in Shabla called Drujba offering 60 beds, a number of private lodgings, and a camping site. The prices are low even in the active seasons because foreign tourist very rarely come to visit the town. Phones of the hotel: +359 578 30 22, tourist office telephone: +359 578 3038. Beside the restau-rant at the hotel, in recent years Shabia has been offering sufficient catering opportunities at the small private restaurants and snack bars. There are grocers stores, off-road caravans offering food and refreshments. Agricultural products can be bought from at low prices from the local producers. Transport: There are buses going from Varna to Shabla, and via Kavarna to Dobrich. The road from Varna to Shabla is in good condition and it leads to the Romanian border to the north. Besides the Lake of Shabia, there is the Ezerets reservoir close to the town. By the fishing settlement of Krapets, approx. 16 km North-East of the town there is the camping site of Dobruja. The Durankulak Moor is further northwards and is famous for being a reserve for a number of marsh birds; some of them are registered in the Red Book of the species in Bulgaria. Quite near the town is the yachting club where the annual yacht-regatta along the Black Sea coast starts.